Hardcover jacket flap: Since her #1 hit single “I Will Survive” debuted to overwhelming success in 1978, Gloria Gaynor has become a music legend. Recorded during a time of personal tragedy and hardship, the song became Gloria’s personal anthem, helping her to survive abuse, a rocky career, and a declining marriage. Gloria hoped “I Will Survive” would also empower her fans but never imagined that it would become an emotional lifeline to men and women around the world. To this day, Gloria travels extensively to share the inspirational message of her Grammy Award-winning song, proving that its relevance has transcended the disco era and continues to touch millions of lives worldwide. Throughout the years, Gloria has been the recipient of thousands of personal messages from individuals whose lives were transformed by “I Will Survive.” In this remarkable collection, Gloria shares forty of these poignant, true stories contributed by her fans. Within these pages, you will discover: • A mother who finds strength to start fresh as she struggles to raise a son with autism. • A cancer survivor who shows uncharacteristic optimism and joy as she refuses to allow illness to dissolve her zeal for life. • A first responder who is able to hope for a bright future even amidst the devastation of the 1995 Oklahoma City bombing. • The powerful story of Annie — a 92-year-old Auschwitz-Birkenau survivor — who hears “I Will Survive” after her husband passes away and makes it her life’s mission to give testimony on the Holocaust. In these and other stories, Gloria presents the compelling accounts of individuals who have survived — and triumphed over — incredible adversity. From all walks of life and from all over the world, millions of people — patients, victims, and innocent bystanders — have found courage, hope, and strength from the power of this timeless song. Hardcover back cover: I Will Survive — a timeless anthem empowering those reaching for positive change in their lives, a sing-along sound track supporting those in a period of transition, often from a dark place to somewhere brighter. - Tina Turner. Gloria Gaynor was launched into international fame in 1978 with the release of her hit single “I Will Survive.” Since its debut, the song has become an emotional anthem for her fans and today it continues to touch the lives of millions of men and women. 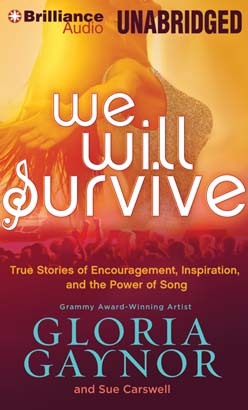 In We Will Survive, Gloria presents forty inspiring, true stories about the power of “I Will Survive” to transform people’s lives. From a mother who finds the strength to start fresh as she struggles to raise a son with autism to the powerful story of a 92-year-old Auschwitz-Birkenau survivor, millions of people from all walks of life have found courage, hope, and the strength to survive from Gloria’s remarkable song. Paperback back cover: [Turner name should be prominent]:Bannerline: I Will Survive — a timeless anthem empowering those reaching for positive change in their lives, a sing-along sound track supporting those in a period of transition, often from a dark place to somewhere brighter. — Tina Turner Back Cover: Gloria Gaynor was launched into international fame in 1978 with the release of her hit single “I Will Survive.” Since its debut, the song has become an emotional anthem for her fans and today it continues to touch the lives of millions of men and women. In We Will Survive, Gloria presents forty inspiring, true stories about the power of “I Will Survive” to transform people’s lives. From a mother who finds the strength to start fresh as she struggles to raise a son with autism to the powerful story of a 92-year-old Auschwitz-Birkenau survivor, millions of people from all walks of life have found courage, hope, and the strength to survive from Gloria’s remarkable song.